Subway band perform live music for wedding receptions in and around the Oxfordshire, Berkshire, Wiltshire, Gloucestershire, Bedfordshire, Northamptonshire, and home counties areas. For a quick quotation or to discuss your wedding or event arrangements, get in contact with us. This is a sample wedding set list that Subway have performed. 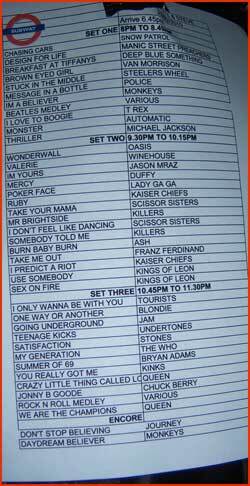 This example of a wedding reception music play list has been devised with years of experience and with a family atmosphere in mind we try and play something for everyone to keep your guests entertained and the party going. "YOUR SPECIAL SONG LEARNED BY THE BAND"
All the set lists are put together and authored by Mary Anne + to suit the bride and groom or host of the party, although special care is taken to ensure there are great dance tunes for everyone.